Snack foods that require no refridgeration: bananas, apples, fixings for peanut butter and jelly sandwiches, crackers, granola bars etc. A plan for cold foods: we have a cooler and have been storing up extra ice. The hope is that any power will only be out shortly so we can just keep the fridge closed (and we set it to the coldest level last night to chill it out as much as possible) and wait it out, but we’ll do what we need to. Stay dry and safe out there. We’re lucky this storm missed hitting DC directly, but it looks like parts of NJ and NY are really facing some brutal winds and surf. Hoping all have moved to higher ground, and stay wary of down power lines etc. Yes, that title is a mouthful, but it’s the most accurate thing I could think of. And clearly “accuracy” is so important in my “a little bit of this”, “a little bit of that” kind of cooking. ANYWAY, this was probably one of the best dishes I’ve created this year, so get excited. AND it’s vegan. AND if you use rice noodles instead (and are of course careful about the sauce thing), it could be vegan and gluten free… what??? 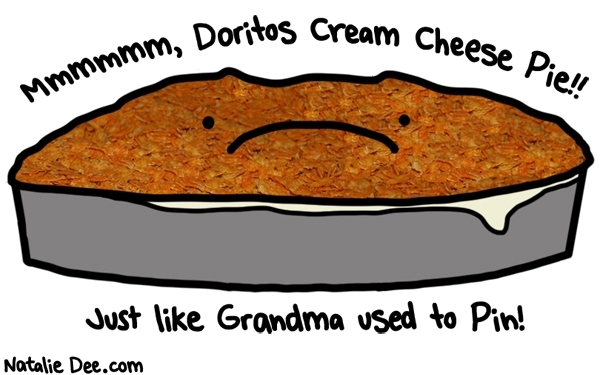 And still delicious? Even good for lunch the next day? How can it be? Magic. Or tea-infused grains. Or both perhaps. Boil water like you normally would for making the noodles you’ve chosen. 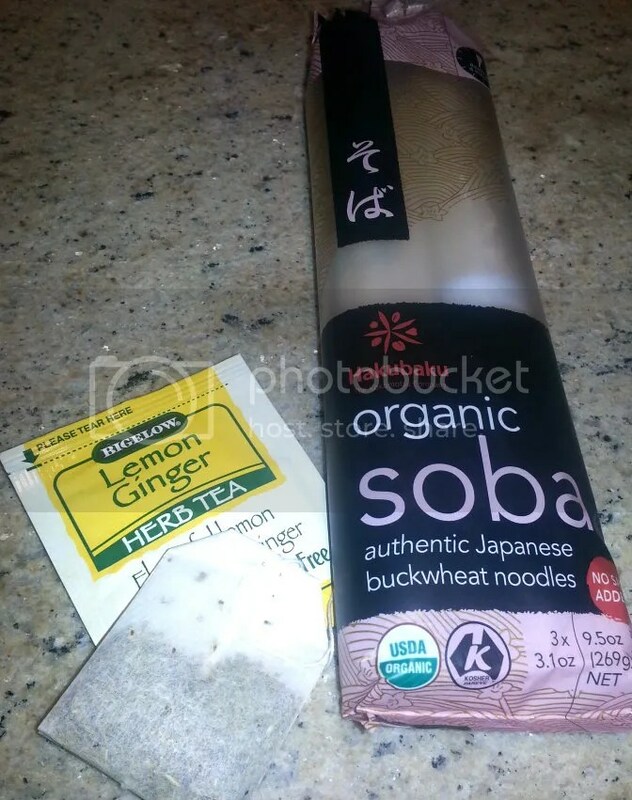 I selected soba noodles (made from buckwheat) because they’re delicious, quick cooking, and have a great texture. But you could certainly use another type of noodle if you liked. Heck, you could probably even use run of the mill spaghetti and make it work here. 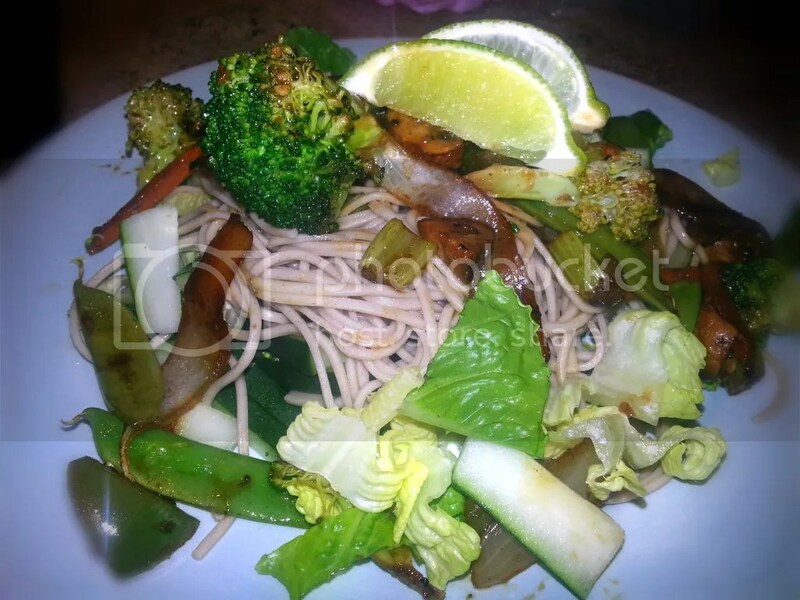 If you go with a rice noodle, this can be made gluten free friendly, which is always a bonus. Add the tea bags to the water when it reaches a boil, and wait at least 2 minutes. You want the water to all be pretty tea-flavored. Then toss in the noodles. Leave the tea bags in while the noodles cook. Cook these until they’re done (according to the directions) and then strain. Give them a light rinse in cold water, and set them aside. I put the soba noodles in a bowl (rinsed and strained) with the 3 steeped tea bags under them just in case more tea flavor would seep out. May not have done anything, but who knows. That’s what I thought made the most sense at the time for whatever reason. You heard me. Get to it. 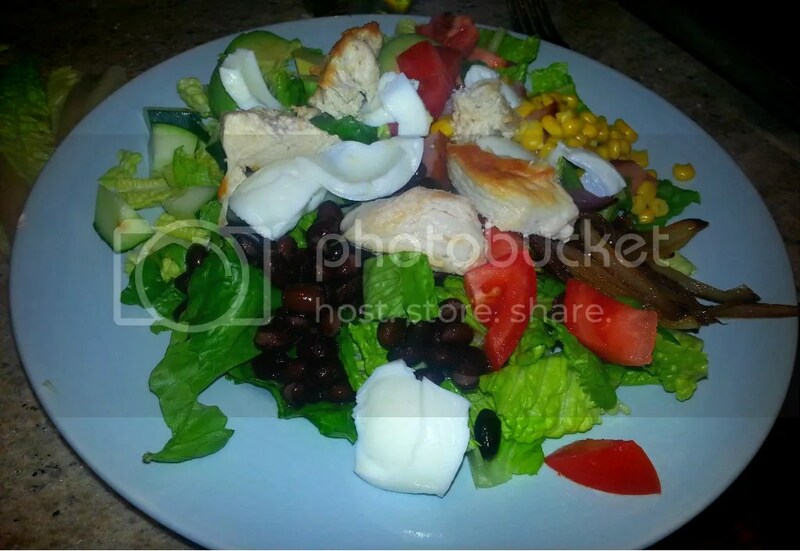 Lettuce and crunchy veggie salad base? Chop and get on a plate. 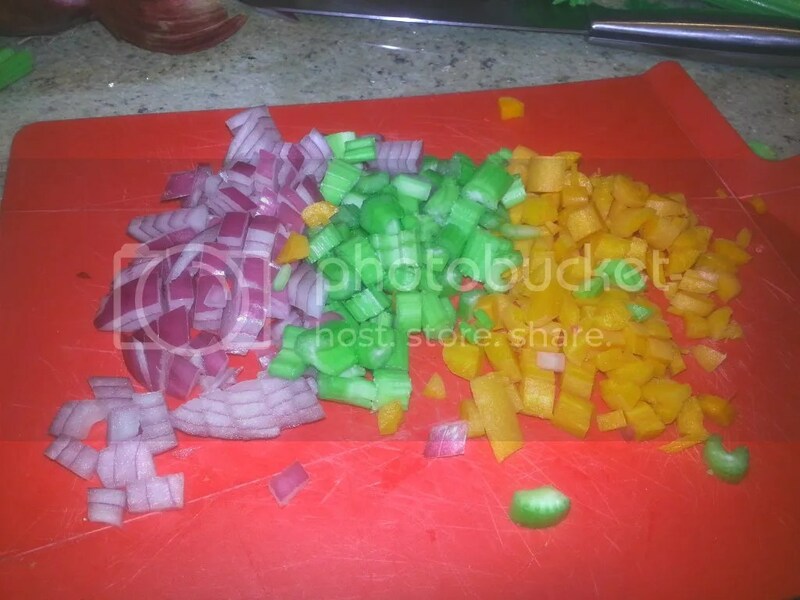 Stir fry veggies? Chop into bite sized bits. You know the drill. 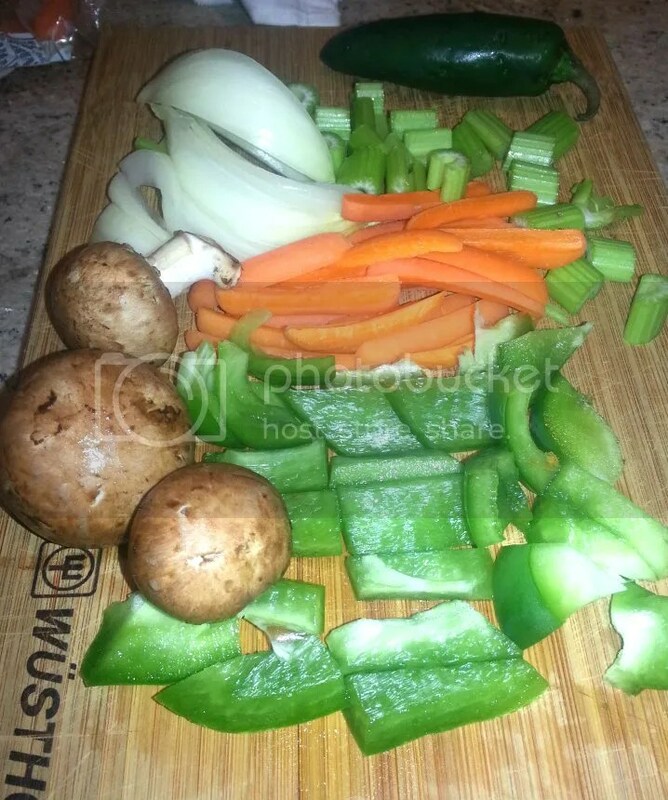 This takes awhile but is totally worth it to have a variety of veggies on your plate. No one wants 2 veggie stir fry – snore. A little bit of everything you have in the fridge or freezer is the way to go. I also highly recommend the jalapeno. Deseeded and chopped up, 1/2 a jalapeno is perfect in this dish. The ginger noodles can be a little sweet so this is wonderful with that. And maybe the noodles too… you want to be ready when your stir fry is done. So get that chopped lettuce, and maybe cabbage or cukes ready to go. 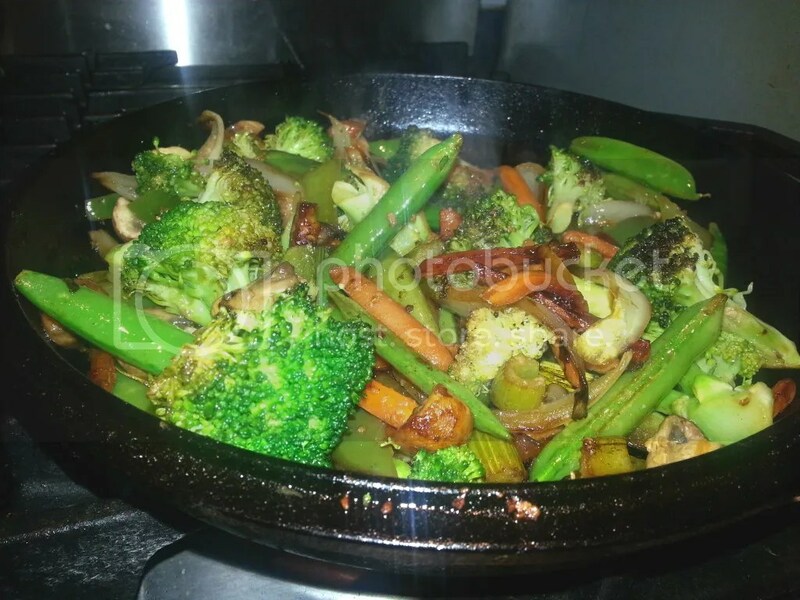 Using a wok or your trusty cast iron (obviously what I used) you want to stir fry the veggies. You can start with medium to medium high heat, your oil, minced garlic and harder veggies like carrots and celery and perhaps onions and peppers. After these have a few minutes to get ahead in the cooking, toss in your sliced mushrooms and jalapenos. Let those stir fry up. Then toss in the softer veggies you want to steam a little, broccoli and snap peas in this case. You may want to cover these for short periods of time, just 30 or 45 seconds at a time. Due to the high heat some veggies will get a little lovely char to them, while the softer veggies should steam to a cooked yet still with a little crunch which is great for this salad. DO NOT overcook your veggies. When in doubt, undercook. 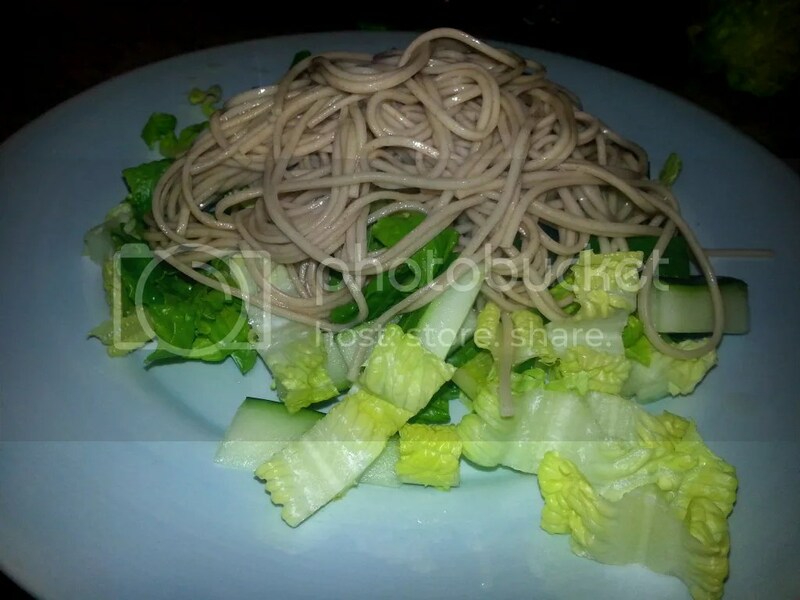 Mushy veggies on soft noodles on lettuce isn’t very appealing. When you think you have about a minute left, add your sauces & any additional spices (a splash of soy sauce, splash of worcestershire, and as much of your stir fry sauce of choice as you wish, small pinch of ground ginger or perhaps pinch of cayenne if you didn’t have the jalapeno but like it spicy) to the pan and toss everything around. 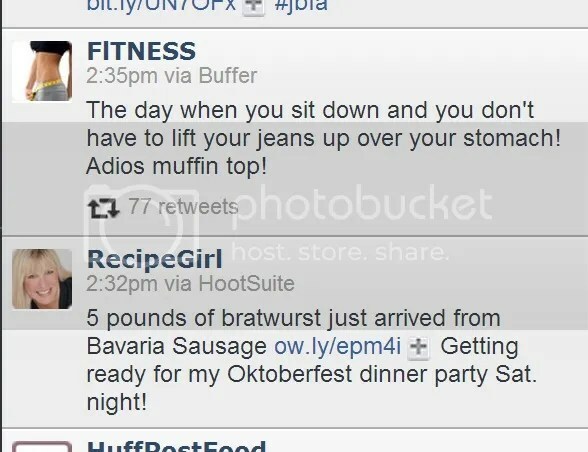 Again, careful about that overcooking thing. When it’s done, pull it off of heat and plate. Enjoy! The tea-infused noodles really add flavor to this dish, so there’s no need for extra sauce or seasoning for the lettuce etc which is great if you’re trying to watch your diet. Sauces can be cruel in regards to sugar and sodium. But tea? Tea is as low cal as it gets for flavoring and was remarkably tasty. I was pretty impressed myself. This also made a wonderful lunch the next day. I put the stir fry on the bottom, then lettuce then noodles (to keep everything from getting too soggy) and then heated it up a little and stirred it up at work. It’d also be good just cold, but was really a treat at room temp/slightly warm too. VERY filling, hearty, healthy and made my week. Try it and let me know what you think! 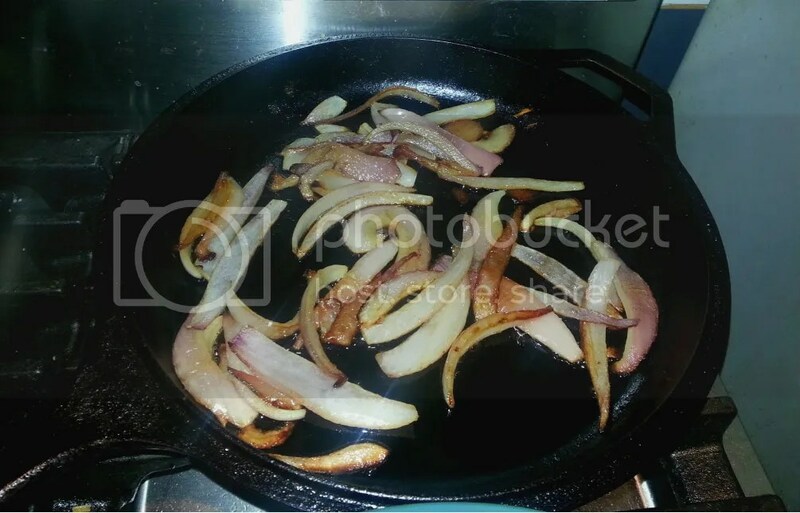 Caramelize those onions…. 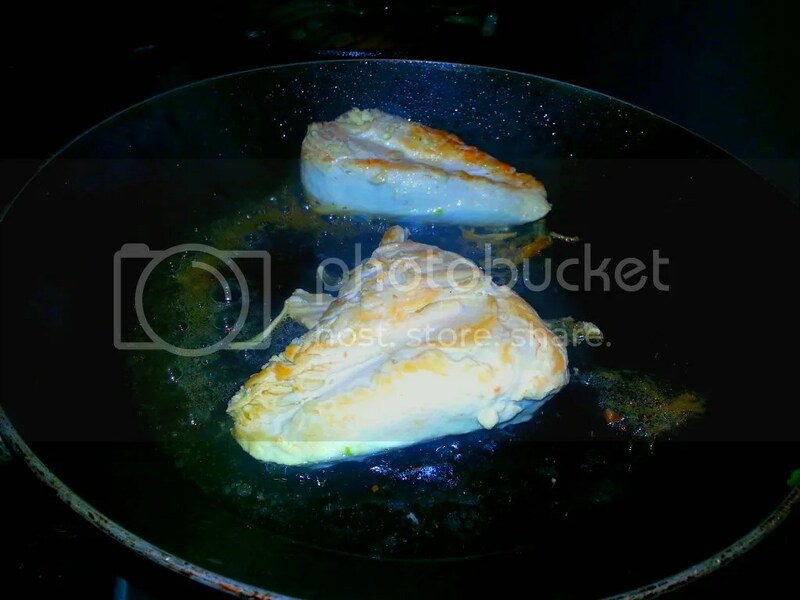 so slice them up thin and toss them in your cast iron with a little bit of olive oil and a pad of butter. If you’re keen on it, you can toss in a pinch of sugar to help this process, but I’m kind of meh about that. Caramelizing onions does take a bit of time, around 45 minutes, but it’s super worth it. My favorite simple explanation of how to do this is from Simply Recipes … I’d recommend checking that out if you’re unfamiliar with the process. Also, if you don’t have hard boiled eggs, you can do this at the same time. It takes about 15 minutes to get the water boiling, then cook the eggs (10 minutes of cook time). 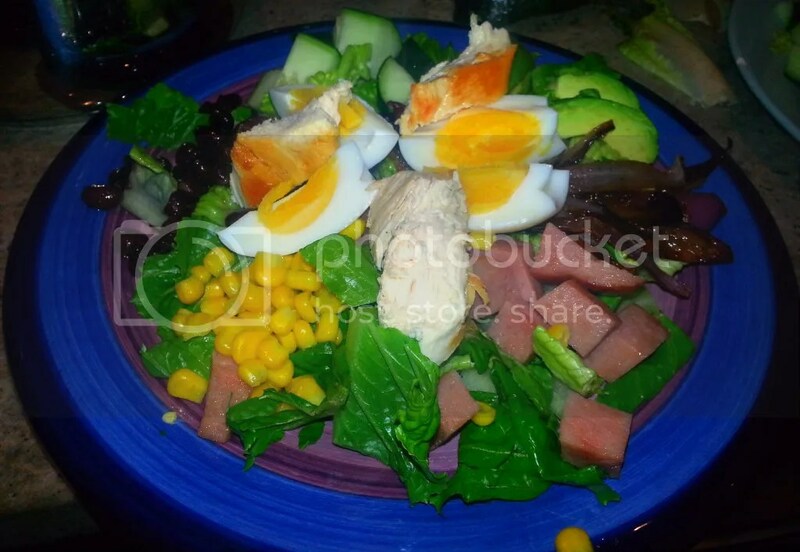 Then cool the eggs in some ice water before the salad arranging ensues. Step 3: Heat up anything that’s frozen or unpleasantly cold. 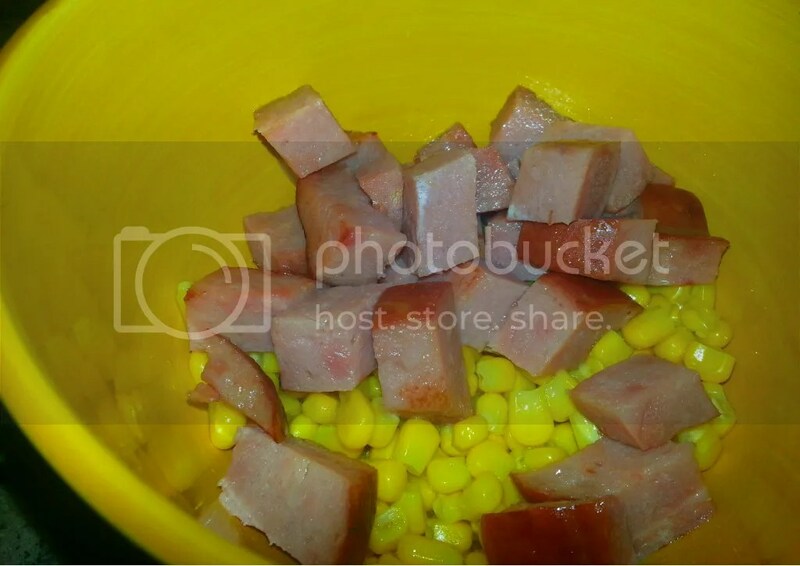 For me, that was frozen corn, and left over ham. For you that might be frozen peas, or black beans (if yours are cold and you’re opposed to such a thing) etc. I shamelessly use the microwave for this. 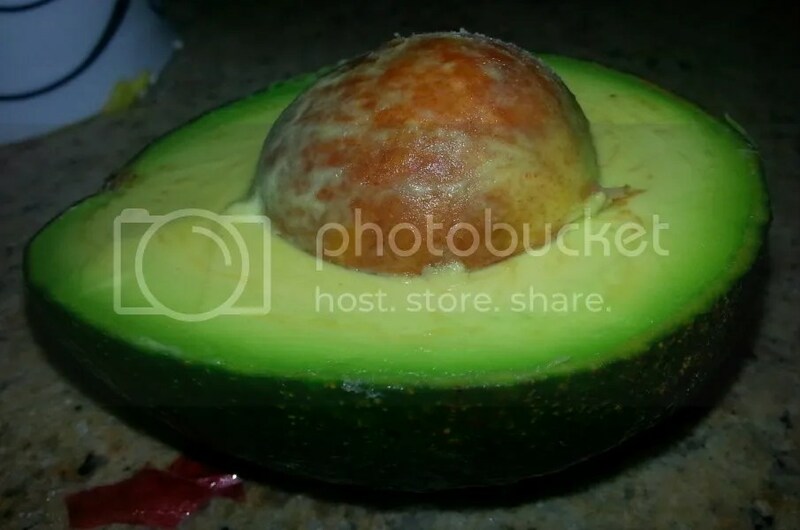 To that cut up about half of an avocado (put the other half on your salad!) 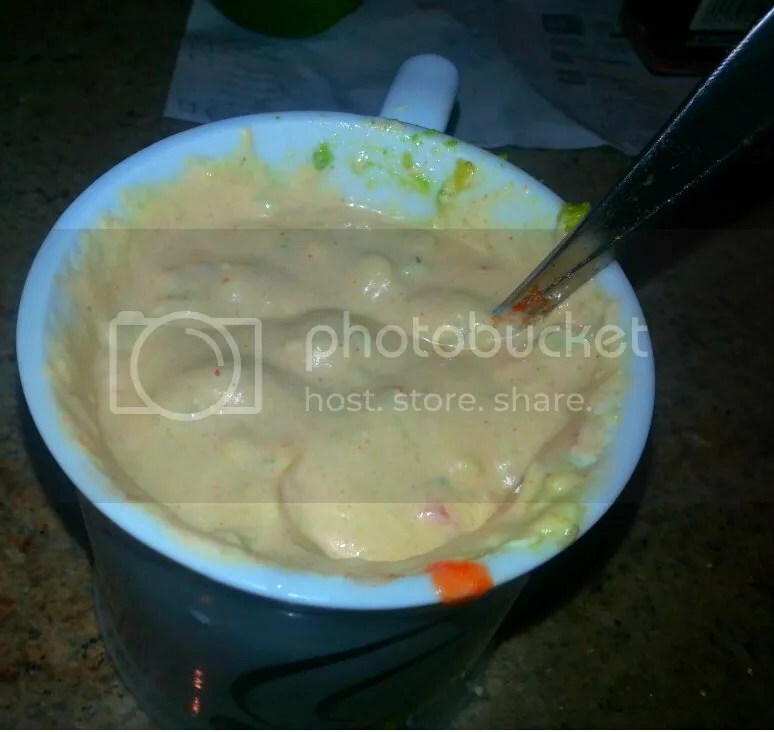 and mash it up into the dressing. Seriously though, why are avocados so delicious and lovely? Anyway, pretty much your dressing is done. If it’s too thick, add a splash or two of olive oil and blend. 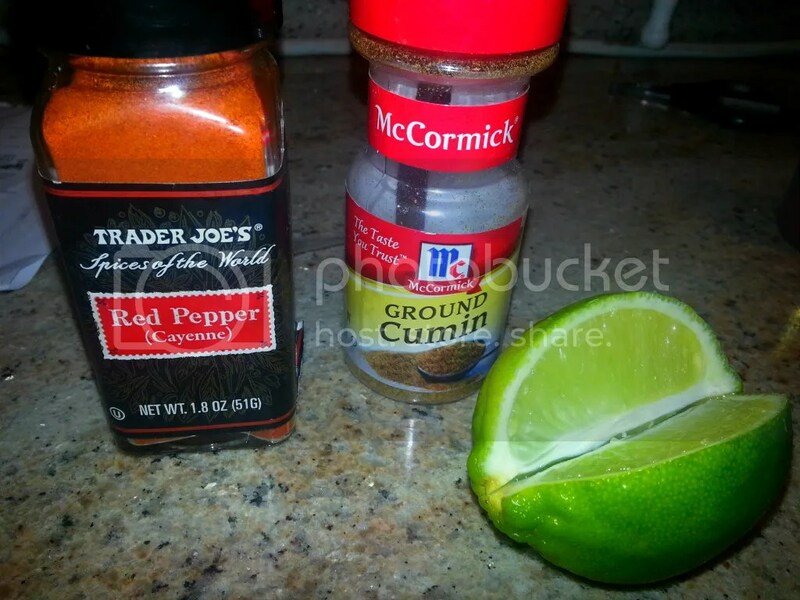 If not spicy enough.. you know, add spices. Do what your taste buds tell you. I didn’t LOVE my dressing but it was a nice change of pace from the typical ranch. And if you’re like me and always make too much of everything – this can be made for lunch the next day at the same time which is a double win in my book. Enjoy! And let us know what your favorite salad toppings & dressings are (and how to make them if they’re fancy like candied walnuts or something). Oh my – time flies when you get sick and don’t blog! Sorry for the delays! I bought an acorn squash over a week ago and finally got to cooking it. I will admit – I’m not a huge squash fan. I find the texture a little weird, and the flavor mostly nonexistent. But it’s fall, and so squash cheaply abounds in all it’s takes-an-eternity-to-go-bad glory, which is enough for me to buy and cook it. USUALLY I’d roast an acorn squash open faced with lots of butter, brown sugar/maple syrup, cinnamon, and nutmeg. BUT dessert squash defeats a little bit of the point. So I tried something else to some success. Ok, Step 1: Cook the wild rice. 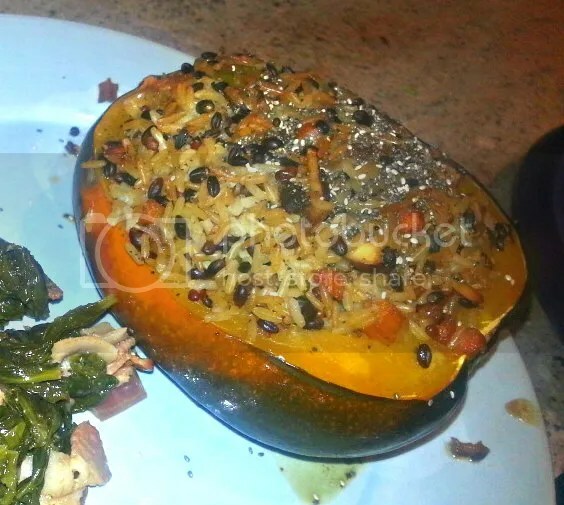 Wild rice is tough and resilient, so no worries about over cooking it really by cooking it in the broth on the stove top and then piling it in the acorn squash to roast up. If you’re nervous about mushy rice (clearly you have some anxiety issues, but that’s ok, we all have our things) you can cook it about 30 minutes and then pull it off of heat. 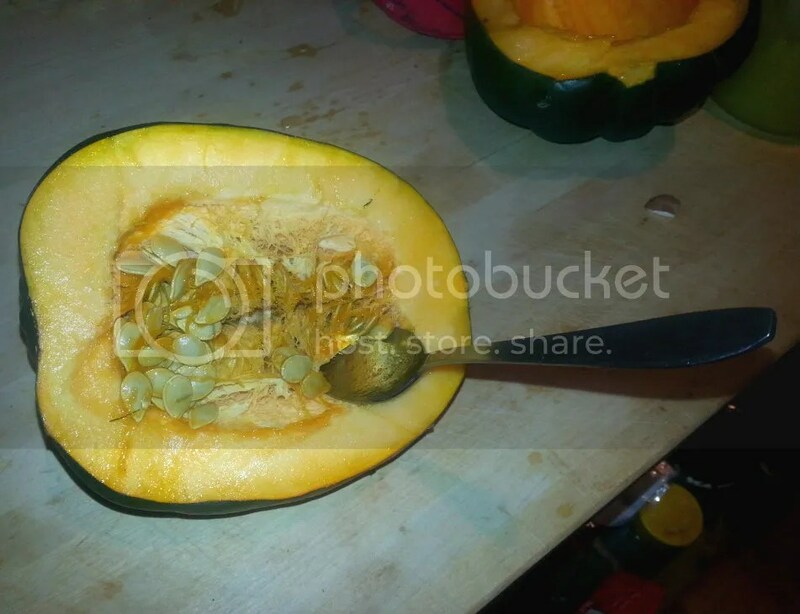 Step 3: While you have the knife and cutting board out, cut through that acorn squash too. 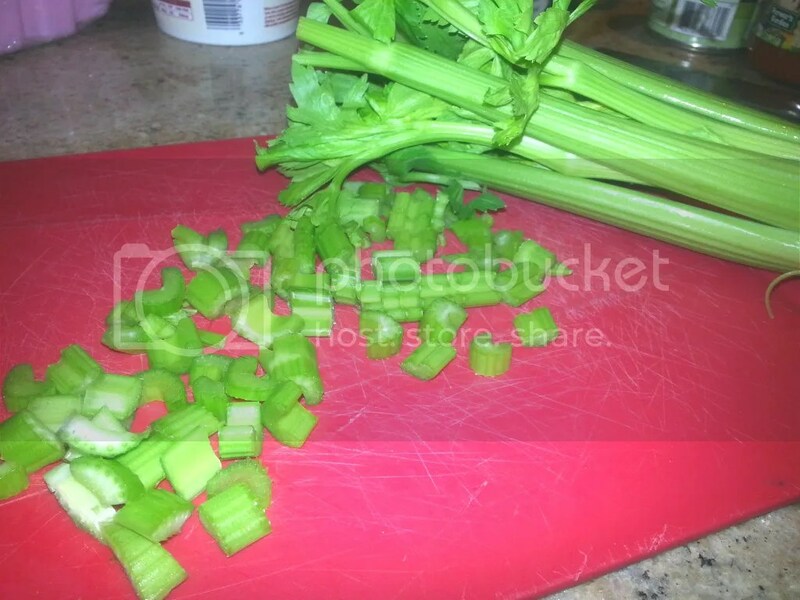 Be careful – they’re hard vegetables and you don’t want to push so hard you slip and cut your fingers. A tip – cut a small slit in the squash with the tip of a knife and then use that slot to press into to cut all the way through. You can cut an acorn squash up and down along a ridge or right across the middle more horizontally… no matter. When that’s all done, you gotta take out the inside. 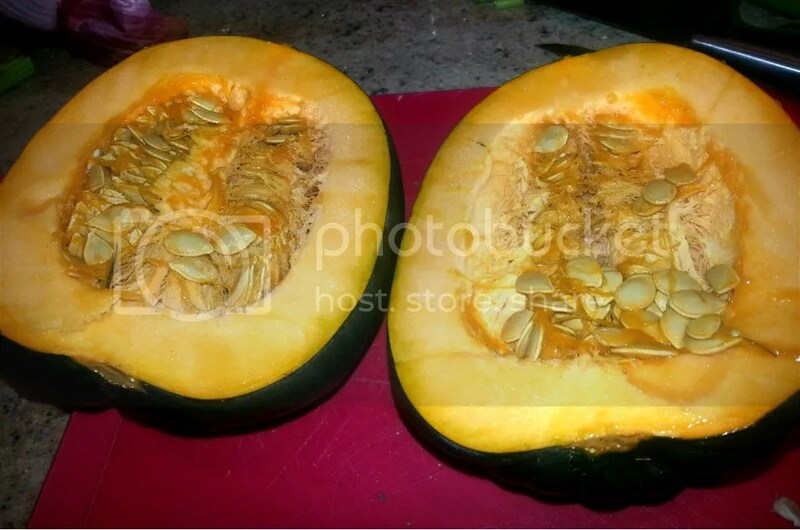 Like a pumpkin, the inside is a little mushy and weird and full of seed (you can roast these later if you wish like pumpkin seeds too). I use a grapefruit spoon for scraping out all the weird slippery strings and that works great. Step 4: When your rice is about 10 minutes from being done cooking (either fully or to your desired partial cooking if you have that rice anxiety), turn your oven to 400 degrees, and turn a burner on medium with your trusty cast iron (or less trusty other pan if you must). In the pan, add 2 tablespoons olive oil, teaspoon (1 clove) minced garlic, your chopped veggies and your almonds if they’re raw (like ours were… seriously, raw almonds… silly). Saute them until the onions start to get clear and then turn off the burner. Step 5: Mix up that wild rice pilaf. 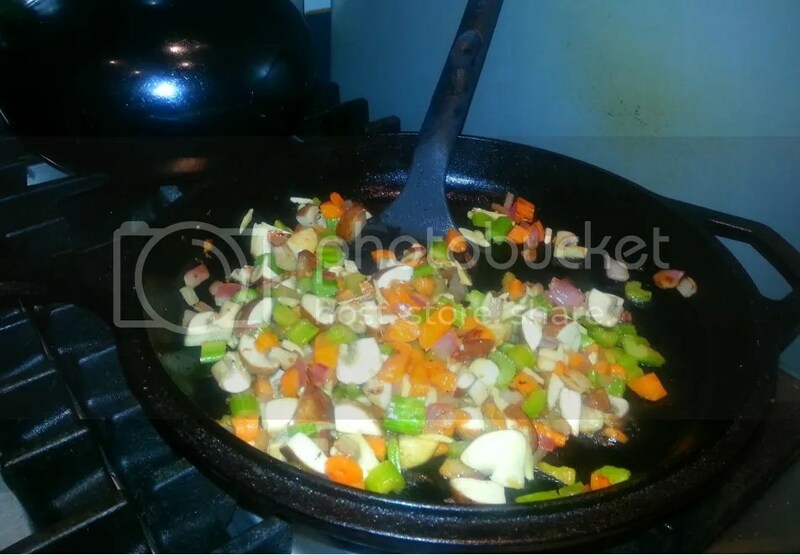 Add the cooked rice, sauteed veggies, and herbs to a bowl and fold together. Taste test. If it needs more herbs, salt, pepper, a dash of worcestershire or soy sauce, some Mrs. Dash, a hug, whatever – add it. You know what tastes good in your mouth, own that. You want your pilaf to be scrumptious. When you’re at a loss for what it might need, I rely (guiltily I assure you) on chicken bouillon and add it teeny bit by teeny bit. A little salty (often MSG laden) powder goes a LONG WAY. Step 6: Place your acorn squash halves on a baking dish (so you know, acorn squash are fat and hard to fit in normal pans… silly nature). Add a tablespoon or so of butter (or non-butter) in each half as well as a sprinkle of salt and pepper and maybe some dried herbs for good measure. I was running out of butter, so I used less butter and a little olive oil with the dried herbs and rubbed that into the squash. It didn’t make much a difference in flavor to do this though so it’s probably easier to just add all the unnecessary herbs to the pilaf and skip all that olive oil rub stuffs. Pile rice pilaf on top of that, pressing in a bit so you can get a good portion in the squash. Step 7: Cover lightly with foil, pop in the oven for about 45 minutes. 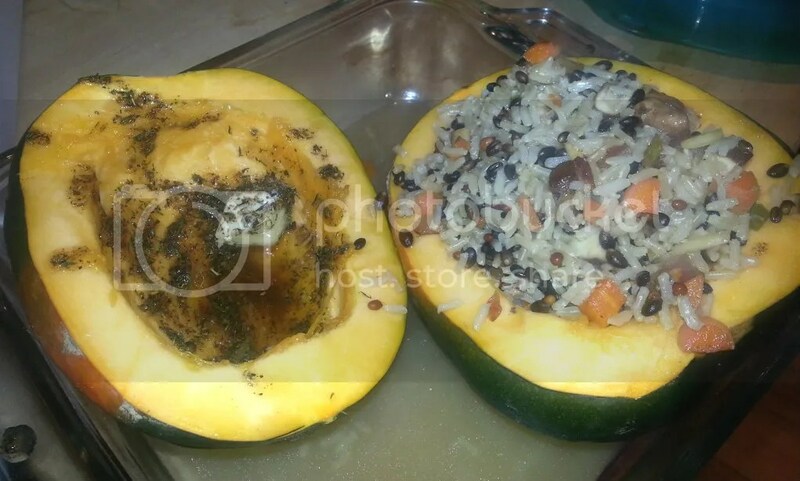 Some other recipes have you make the acorn squash, then fill it with pilaf… either way. I like that they all cook together. Seems right to me. Step 8: Remove from the oven, plate (we sprinkles some chia seeds on top for fun) and enjoy! TADA – fancy looking dinner with normal ingredients and SUPER good for you. I’d suggest drinking some wine with it to balance out all those vitamins… no need to be extreme.